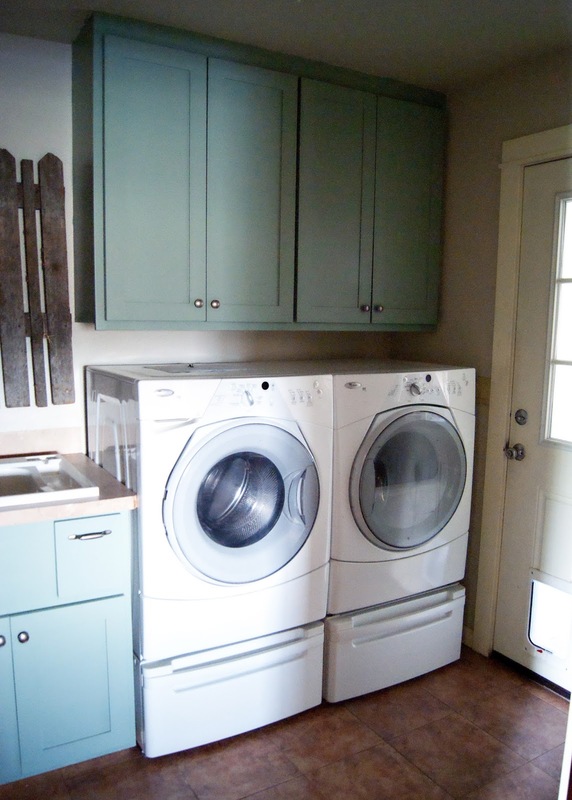 This post was originally publish on 5/28/2014, but has since been edited to include an update about the color used on the cabinets. How's that for a blog post title? embarrassing much? So how come it got bumped to the top of the list? Well, my husband dropped me off at an OB appointment so he could hit a few yard sales near the hospital. I ended up waiting forever and he was done before I even made it into my appointment. He met up with me and was all giddy about a yard sale find. Him: "I got you something you've been wanting FOREVER"
Him: "a pair of things you have wanted and never had and it will help your back not hurt"
Me: "what on earth!? How much did you spend?" Me: "I have no clue what it could be..."
Him: "we need to go get the truck to pick them up"
Me: "just tell me already!" It ended up he found a pair of washer/ dryer pedestals! As great of a find as they were (and we prayed they actually fit our machines) it also meant there was some work that needed to be done to install them. 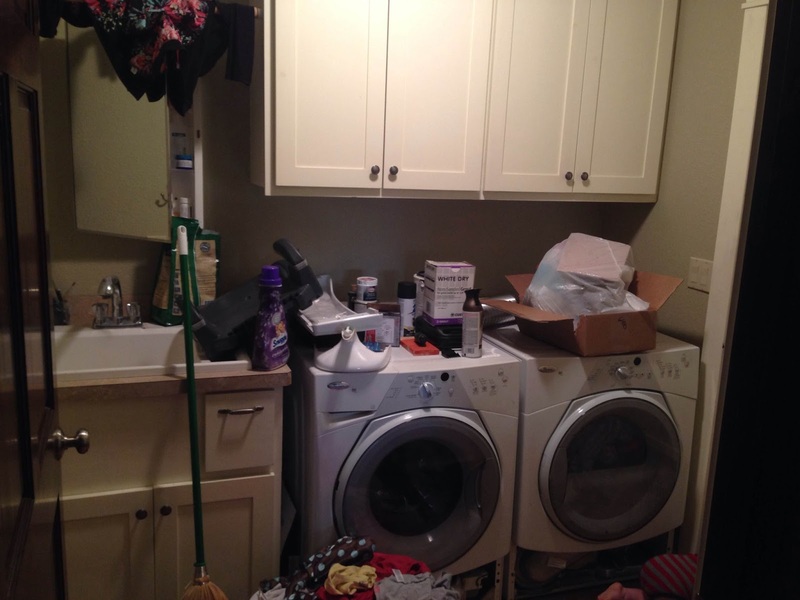 Most important was pulling the machines out so we could reroute the dryer vent. 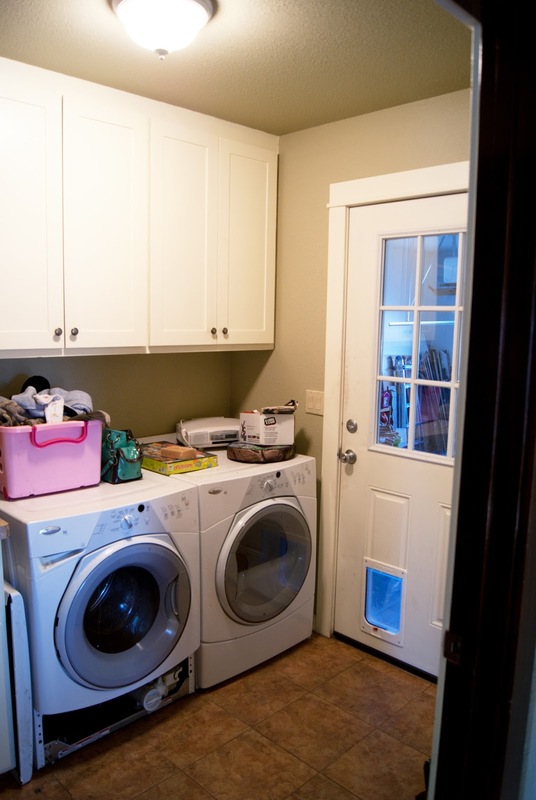 Since the machines were being pulled out and I knew we wouldn't be wanting to do it again anytime soon, I decided it was as good a time as any to paint the laundry room... which meant I needed to also paint the horrible yellowish white cabinets... Since I wasn't planning this makeover, I really didn't want to spend any "extra" money on it. 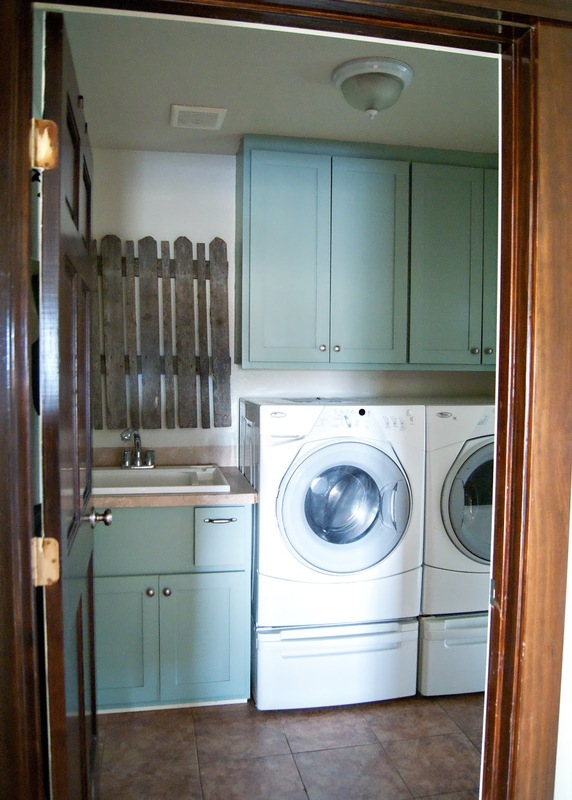 I initially really wanted gray cabinets, but my only gray looked TERRIBLE with the walls - its the middle colored door below.. (bottom door color is original cabinet color ). 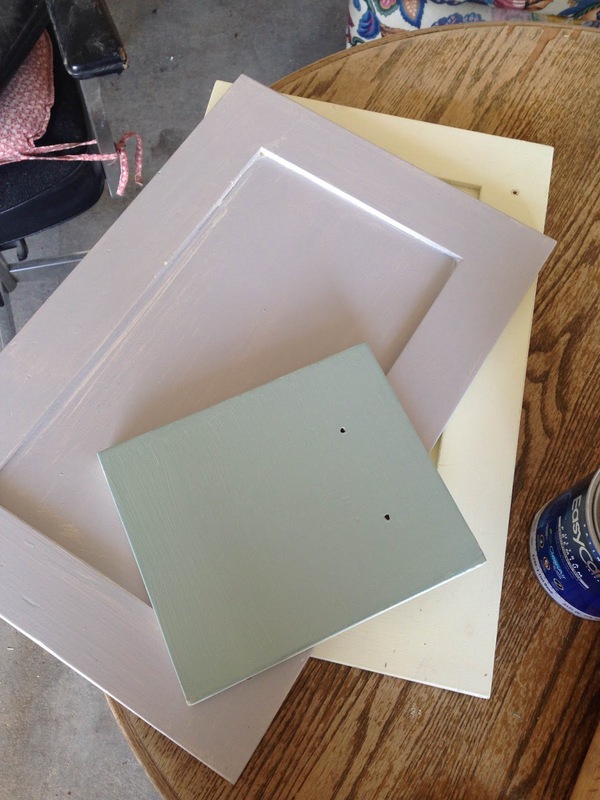 Then I saw this greenish-blue color that I had grabbed at some point (a $2 quart from Home Depot). 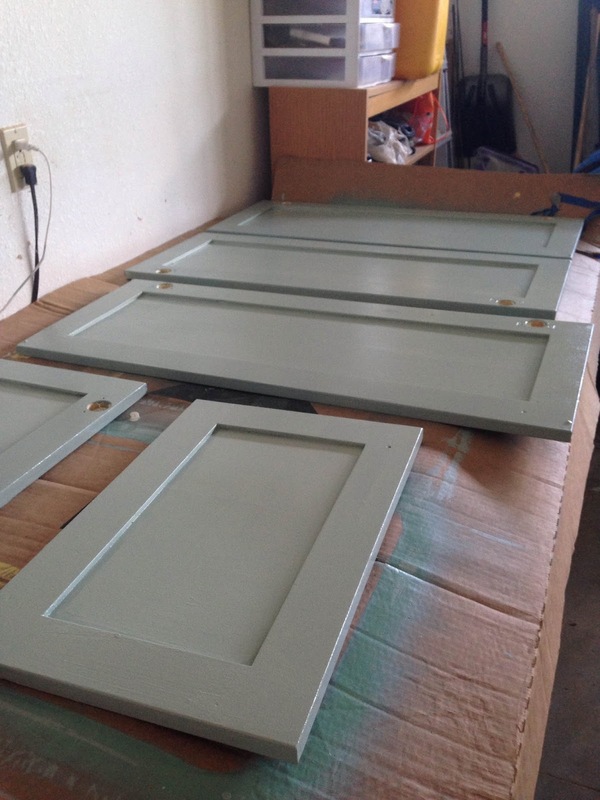 I painted a test door and fell in love! I need to get to Home Depot to see if they can tell me what color it is! Obviously this is just phase one of the makeover. I ended up taking down the medicine cabinet and a drying rod from over the sink and I decided the trim and doors can wait until I do the hallway trim. We still need to address the floors, but I think they look a million times better with just a change of paint colors. 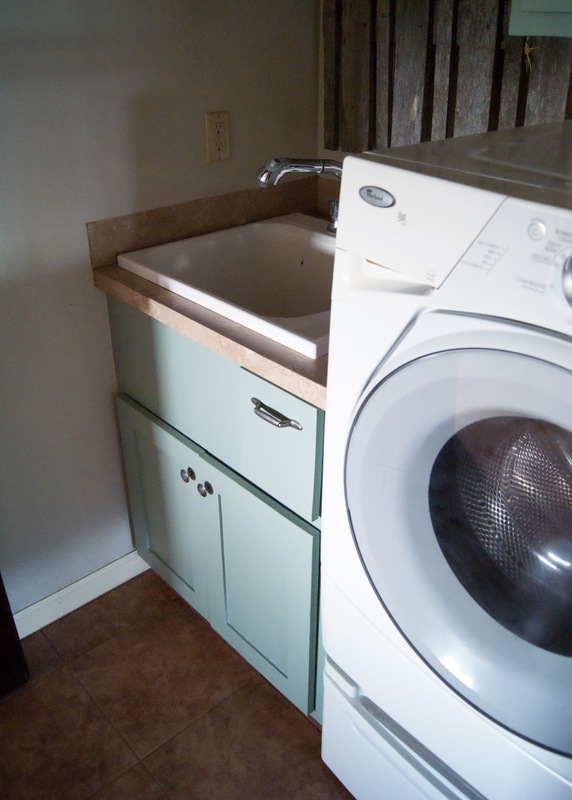 We are also contemplating changing the counter or adding a back splash to sink area. 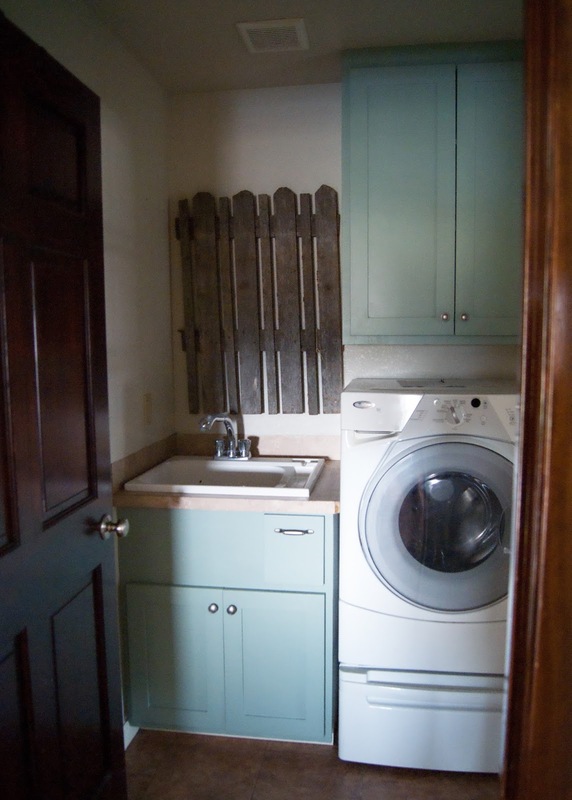 Plus, I have plans to turn the fence into an art piece OR get a drying rack. I think a rug and new light are on the list too, but other than that, I love it! Did I mention this makeover cost me $25.00!!! Everything else we already had! 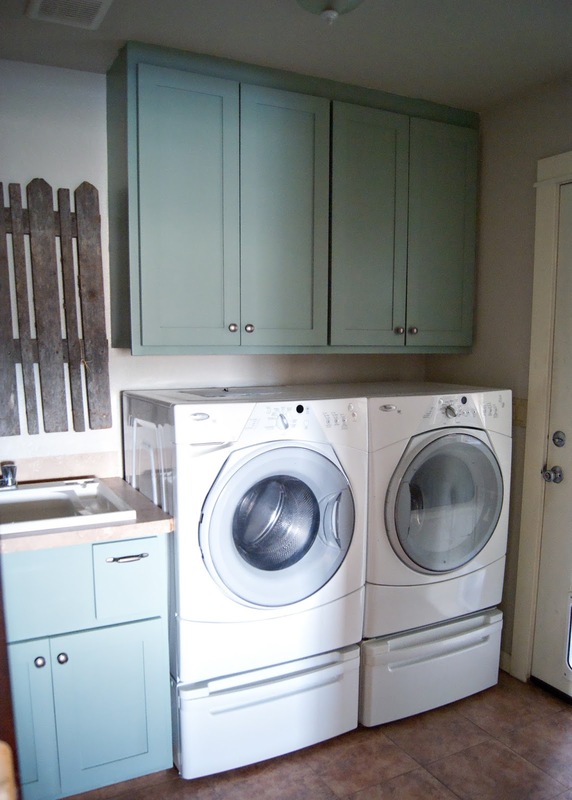 I have had several requests for the color used on the laundry room cabinets. Because it was an "oops" paint I had to have it color matched. You can take the code in the bottom right corner of the image below to your local Home Depot to have a color sample made.